Ancell Corporation manufactures and supplies monoclonal antibodies, recombinant fusion proteins, isotype controls and second step reagents for immunology research. 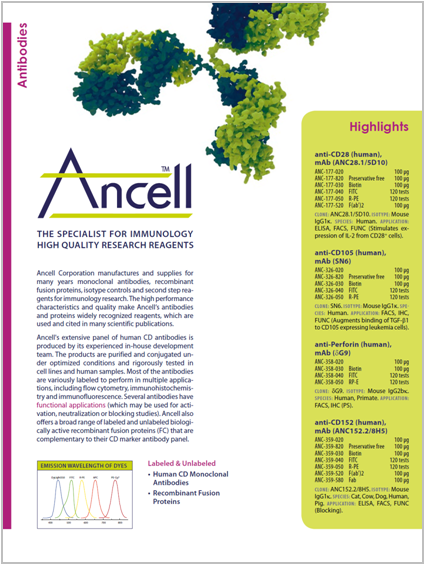 Because of the high performance characteristics and quality and their expertise, Ancell‘s antibodies and proteins are widely recognised reagents and are used and cited in many scientific publications. Ancell offers a comprehensive range of human CD antibodies. They are purified and conjugated under optimized conditions and rigorously tested in cell lines and human samples. Most of the antibodies are developed and variously labelled to perform in multiple applications, including flow cytometry, immunohistochemistry and immunofluorescence. Several antibodies have functional applications (antagonistic antibodies). Ancell also offers a broad range of labelled and unlabelled biologically active recombinant fusion proteins (FC) that are complementary to their CD marker antibody panel. CD markers are an extremely diverse series of leukocyte surface proteins, used as cell markers, and found in various immune cell populations like B cells, thymocytes and T cells. CD proteins serve as receptors and ligands, and regulate cell signalling, cell adhesion and adaptive immunity. CD molecules are utilized in cell sorting techniques and cell populations are usually defined as either positive or negative, to indicate whether or not the cell fraction expresses a particular CD molecule. High-quality monoclonal antibodies against the CD markers allow researchers to easily examine cellular signalling events in complex cell populations and are commonly used for immunology, cancer and stem cell biology research. The Monoclonal Antibodies are available with various fluorescent labels and as a preservative free form! anti-CD80 [B7-1] (human), mAb (BB1) 100 µg Ref. ANC-100-020 Marque ANCELL 189.00	€ H.T. anti-CD80 [B7-1] (human), mAb (BB1) (Biotin) 100 µg Ref. ANC-100-030 Marque ANCELL 282.00	€ H.T. anti-CD80 [B7-1] (human), mAb (BB1) (FITC) 120 tests Ref. ANC-100-040 Marque ANCELL 282.00	€ H.T. anti-CD80 [B7-1] (human), mAb (BB1) (preservative free) 100 µg Ref. ANC-100-820 Marque ANCELL 189.00	€ H.T. anti-TCR Cbeta1 (human), mAb (Jovi-1) 100 µg Ref. ANC-101-020 Marque ANCELL 205.00	€ H.T. anti-TCR Cbeta1 (human), mAb (Jovi-1) (Biotin) 100 µg Ref. ANC-101-030 Marque ANCELL 308.00	€ H.T. anti-TCR Cbeta1 (human), mAb (Jovi-1) (FITC) 120 tests Ref. ANC-101-040 Marque ANCELL 308.00	€ H.T. anti-TCR Cbeta1 (human), mAb (Jovi-1) (R-PE) 120 tests Ref. ANC-101-050 Marque ANCELL 410.00	€ H.T. anti-TCR Cbeta1 (human), mAb (Jovi-1) (preservative free) 100 µg Ref. ANC-101-820 Marque ANCELL 205.00	€ H.T. anti-TCR Vbeta3 (human), mAb (Jovi-3) 100 µg Ref. ANC-102-020 Marque ANCELL 205.00	€ H.T. anti-TCR Vbeta3 (human), mAb (Jovi-3) (Biotin) 100 µg Ref. ANC-102-030 Marque ANCELL 308.00	€ H.T. anti-TCR Vbeta3 (human), mAb (Jovi-3) (FITC) 120 tests Ref. ANC-102-040 Marque ANCELL 308.00	€ H.T. anti-TCR Vbeta3 (human), mAb (Jovi-3) (R-PE) 120 tests Ref. ANC-102-050 Marque ANCELL 410.00	€ H.T. anti-TCR Vbeta3 (human), mAb (Jovi-3) (preservative free) 100 µg Ref. ANC-102-820 Marque ANCELL 205.00	€ H.T. anti-CD80 [B7-1] (human), mAb (P1.H1.A1.A1) 100 µg Ref. ANC-110-020 Marque ANCELL 189.00	€ H.T. anti-CD80 [B7-1] (human), mAb (P1.H1.A1.A1) (Biotin) 100 µg Ref. ANC-110-030 Marque ANCELL 282.00	€ H.T. anti-CD80 [B7-1] (human), mAb (P1.H1.A1.A1) (R-PE) 120 tests Ref. ANC-110-050 Marque ANCELL 308.00	€ H.T. anti-CD80 [B7-1] (human), mAb (P1.H1.A1.A1) (preservative free) 100 µg Ref. ANC-110-820 Marque ANCELL 189.00	€ H.T. anti-MHC Class I (human), mAb (3F10) 100 µg Ref. ANC-121-020 Marque ANCELL 154.00	€ H.T. anti-MHC Class I (human), mAb (3F10) (Biotin) 100 µg Ref. ANC-121-030 Marque ANCELL 189.00	€ H.T. anti-MHC Class I (human), mAb (3F10) (FITC) 120 tests Ref. ANC-121-040 Marque ANCELL 189.00	€ H.T. anti-MHC Class I (human), mAb (3F10) (R-PE) 120 tests Ref. ANC-121-050 Marque ANCELL 256.00	€ H.T. anti-MHC Class I (human), mAb (3F10) (preservative free) 100 µg Ref. ANC-121-820 Marque ANCELL 154.00	€ H.T. anti-CD235 [Glycophorin A] (human), mAb (A63-B/C2) 100 µg Ref. ANC-122-020 Marque ANCELL 154.00	€ H.T. anti-CD235 [Glycophorin A] (human), mAb (A63-B/C2) (Biotin) 100 µg Ref. ANC-122-030 Marque ANCELL 189.00	€ H.T. 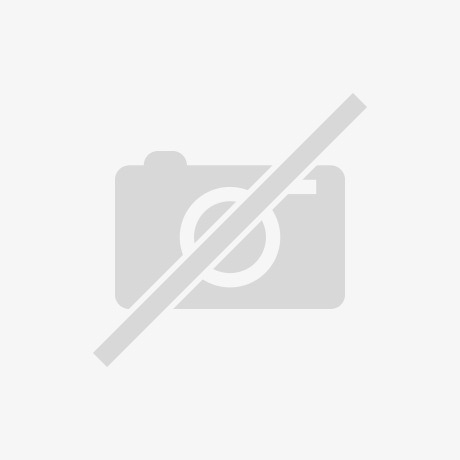 anti-CD235 [Glycophorin A] (human), mAb (A63-B/C2) (FITC) 120 tests Ref. ANC-122-040 Marque ANCELL 189.00	€ H.T. anti-CD235 [Glycophorin A] (human), mAb (A63-B/C2) (preservative free) 100 µg Ref. ANC-122-820 Marque ANCELL 154.00	€ H.T. anti-CD326 (human), mAb (ANC8D4) 100 µg Ref. ANC-126-020 Marque ANCELL 189.00	€ H.T. anti-CD326 (human), mAb (ANC8D4) (Biotin) 100 µg Ref. ANC-126-030 Marque ANCELL 282.00	€ H.T. anti-CD326 (human), mAb (ANC8D4) (FITC) 120 tests Ref. ANC-126-040 Marque ANCELL 282.00	€ H.T. anti-CD326 (human), mAb (ANC8D4) (R-PE) 120 tests Ref. ANC-126-050 Marque ANCELL 308.00	€ H.T. anti-CD326 (human), mAb (ANC8D4) (preservative free) 100 µg Ref. ANC-126-820 Marque ANCELL 189.00	€ H.T. anti-MHC Class II (human), mAb (TDR31.1) 100 µg Ref. ANC-131-020 Marque ANCELL 154.00	€ H.T. anti-MHC Class II (human), mAb (TDR31.1) (Biotin) 100 µg Ref. ANC-131-030 Marque ANCELL 189.00	€ H.T. anti-MHC Class II (human), mAb (TDR31.1) (FITC) 120 tests Ref. ANC-131-040 Marque ANCELL 189.00	€ H.T. anti-MHC Class II (human), mAb (TDR31.1) (R-PE) 120 tests Ref. ANC-131-050 Marque ANCELL 256.00	€ H.T. anti-MHC Class II (human), mAb (TDR31.1) (APC) 120 tests Ref. ANC-131-060 Marque ANCELL 421.00	€ H.T. anti-MHC Class II (human), mAb (TDR31.1) (preservative free) 100 µg Ref. ANC-131-820 Marque ANCELL 154.00	€ H.T. anti-Igkappa (human), mAb (L1C1) 100 µg Ref. ANC-136-020 Marque ANCELL 154.00	€ H.T. anti-Igkappa (human), mAb (L1C1) (Biotin) 100 µg Ref. ANC-136-030 Marque ANCELL 189.00	€ H.T. anti-Igkappa (human), mAb (L1C1) (FITC) 120 tests Ref. ANC-136-040 Marque ANCELL 189.00	€ H.T. anti-Igkappa (human), mAb (L1C1) (R-PE) 120 tests Ref. ANC-136-050 Marque ANCELL 256.00	€ H.T. anti-Igkappa (human), mAb (L1C1) (preservative free) 100 µg Ref. ANC-136-820 Marque ANCELL 154.00	€ H.T. anti-IgA (human), mAb (Hisa43) 100 µg Ref. ANC-137-020 Marque ANCELL 154.00	€ H.T. anti-IgA (human), mAb (Hisa43) (Biotin) 100 µg Ref. ANC-137-030 Marque ANCELL 189.00	€ H.T. anti-IgA (human), mAb (Hisa43) (FITC) 120 tests Ref. ANC-137-040 Marque ANCELL 189.00	€ H.T. anti-IgA (human), mAb (Hisa43) (R-PE) 120 tests Ref. ANC-137-050 Marque ANCELL 256.00	€ H.T. anti-IgA (human), mAb (Hisa43) (preservative free) 100 µg Ref. ANC-137-820 Marque ANCELL 154.00	€ H.T. anti-Iglambda, mAb (human) (ICO106) 100 µg Ref. ANC-138-020 Marque ANCELL 154.00	€ H.T. anti-Iglambda, mAb (human) (ICO106) (Biotin) 100 µg Ref. ANC-138-030 Marque ANCELL 189.00	€ H.T.